The port of Chalus is located in Mazandaran Province, on the coast of the Caspian Sea. The river Chalus flows through the city and stretches up to the Caspian Sea. 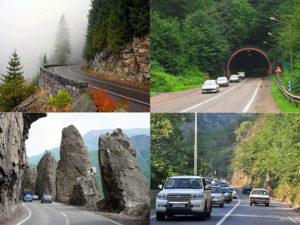 In Iran, Chalus is considered a famous resort with the warm and moderately humid weather. The main product of the city is rice and citrus fruits. The most popular attraction of Chalus is the entertainment complex Namak-Abrud. It is located within 12 km from the city. The entertainment complex has a hotel, a funicular for climbing the mountain peaks of Alam-kuh and Takht-e Suleiman. The mountain peaks are quite popular among climbers and trekkers. In Chalus, guests will also be able to enjoy beautiful parks, streets lounging in the greenery of trees, as well as cozy sanatoria located on the beach.